A TEAM Visits State Capitol to Advocate for Choice - Opportunities, Inc.
On March 1, A TEAM Wisconsin members from around the state joined together for their fourth annual Day for Choice advocacy event. A TEAM Wisconsin’s 10 state chapters are part of a national grassroots movement to ensure option and opportunities continue to advance for individuals with diverse abilities. In past years, the team has been successful in meeting with over 75 legislators and having over 100 attendants. Again this year, representatives from all parts of the state participated in this important day for advocacy. The event was in partnership with Rehabilitation for Wisconsin in Action, the state association representing community rehabilitation programs that specialize in training and employment services for a diverse workforce. A TEAM members spent the day meeting with legislators to promote the importance of independence and work choice. The highlight of the day was a personal visit from Governor Walker who shared the group’s enthusiasm for work and its importance in providing dignity and purpose, as well as, his support for a full array of employment options here in the state. 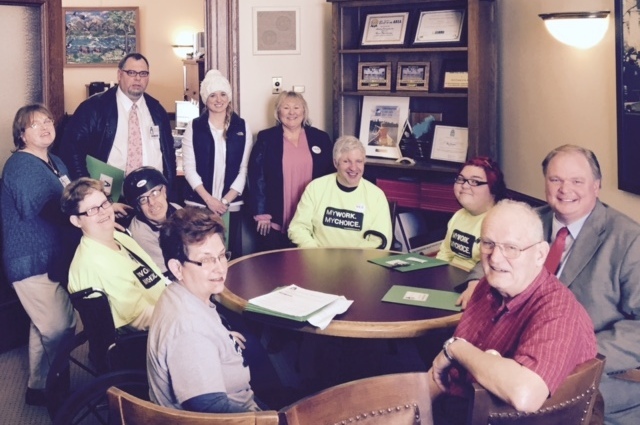 Members were eager to meet with the governor and thank him for his policies that positively impact individuals with diverse abilities such as Wisconsin’s Better Bottom Line initiative. The initiative expands training and business incentives to hire people with diverse abilities in the community. Advocates from the A TEAM Southeastern Wisconsin chapter, which includes members from Jefferson County, Walworth County, Dane County and Waukesha County, met with both representatives and senators from their districts, including Representatives Jorgensen, Kleefisch, Horlacher, Jagler, Neylon, Sargent, Taylor and Senators Fitzgerald, Nass, Kapenga, Lazich, Miller, and Risser. Each legislator welcomed the members and listened attentively to their powerful testimonies and discussion on the future of service choices here in Wisconsin. For more information, visit www.ateamwisconsin.org. John T. presenting the Governor with A TEAM shirt.